It was a beautiful evening to final get out for a little En Plein Air painting. 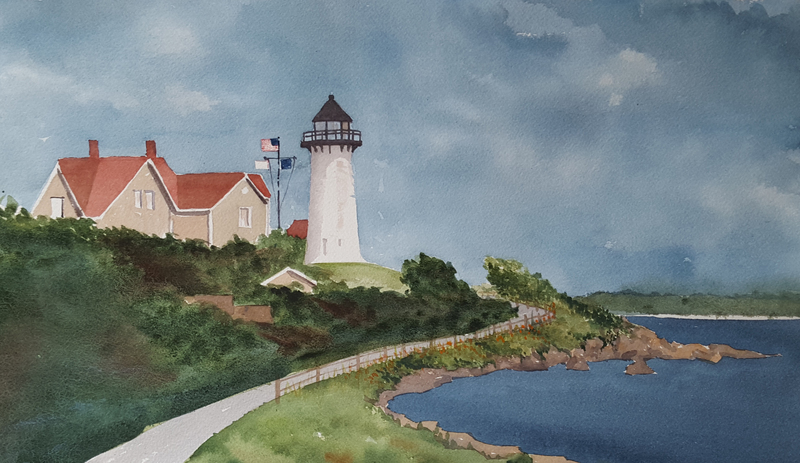 The view is of Nobska Light in Woods Hole, Massachusetts from Church Street. It was a perfect location in that I was able to set-up the easel and sit in the back of my SUV with the rear hatch open. To my right was the sound of the waves and the smell of the salt air and sea roses. It does not get much better than this. Holbein and Mission Watercolors on Fluid 140# cold press watercolor paper. Finished size is 11″ x 18″. Today our family and friends said goodbye to a beautiful woman who was taken too early from her loved ones. Beverly Collins Decas. As stated beautifully by her daughter Alexandra Decas – Beverly was a master in the art of friendship going to great lengths to nurture bonds, express her care and appreciation and most importantly to convey her gratitude for those numerous relationships. Her smile, wit, love of life, and positive energy was bestowed upon many and will be deeply missed. She loved people, connected deeply, and was loved in return. 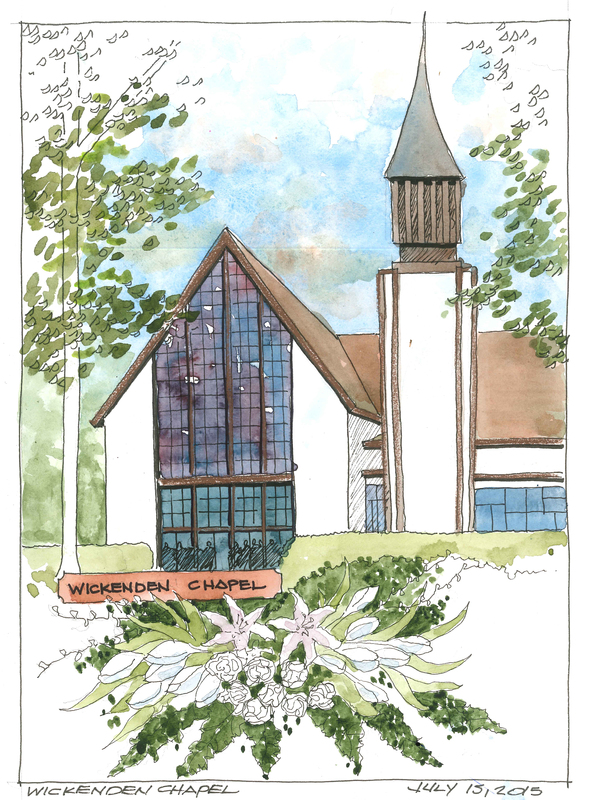 Todays sketch is of Wickenden Chapel on the campus of Tabor Academy in Marion, MA, Faber-Castell Art pens with Holbein Watercolors in a Stillman and Birn Alpha Sketchbook. 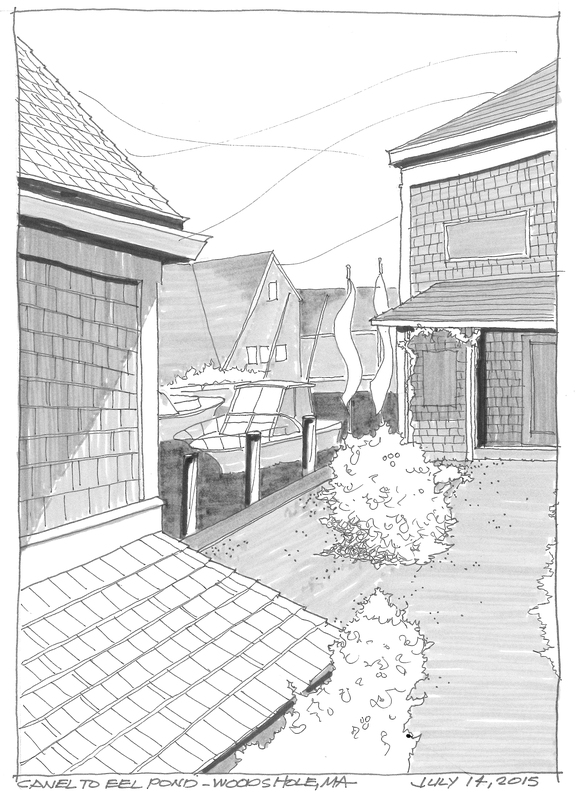 This is a sketch from a photo that I snapped last weekend in Woods Hole, Massachusetts. The location is the small canal that connects Great Harbor to Eel Pond. The Eel Pond Draw Bridge is used to allow Water Street to cross the canal and is located in Woods Hole, Massachusetts. The drawbridge was rebuilt during the winter of 2008-2009. I chose to make a tonal study of this sketch. Faber-Castel Pit Art pens in Black and shades of Grey in a 9 x 12 Alpha Series Stillman and Birn Sketchbook. We had an impromptu dinner date tonight with our best friends Keith and Katherine to celebrate her birthday. 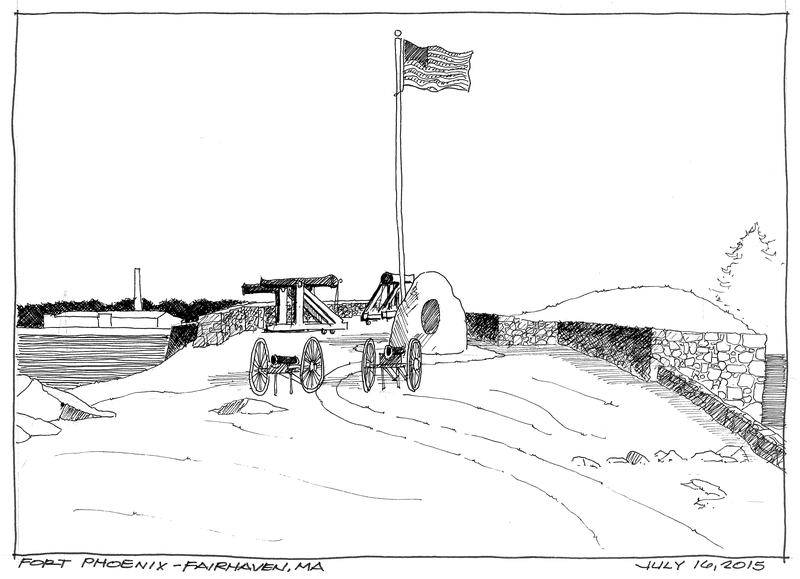 They had spent the day on Martha’s Vineyard and we met at the Quahog Republic in the hamlet of Onset, Massachusetts. 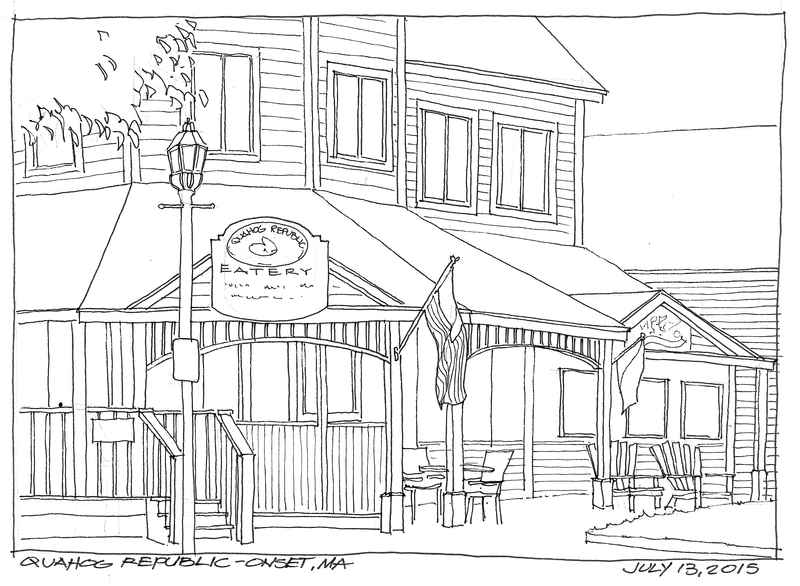 It is a great little casual restaurant across the street from the water in Onset. A quick ink line drawing in my Alpha Series Stillman and Birn. While cleaning and preparing the fountain in our yard for this season, I noticed a Spotted Salamander. I have never seen one of these before and it was about 6″ long. They are stout, like most mole salamanders, and have wide snouts. The spotted salamander’s main color is black with two uneven rows of yellowish-orange spots run from the top of the head (near the eyes) to the tip of the tail. 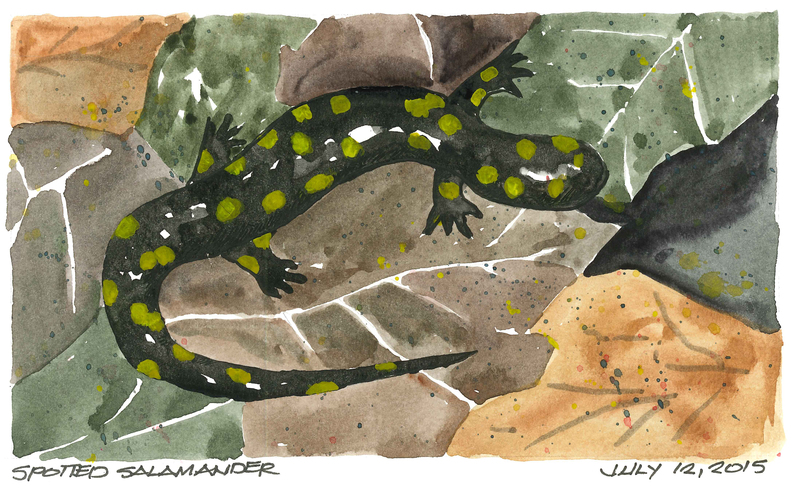 The spotted salamander usually makes its home in hardwood forest areas with vernal pools, which are necessary for breeding. Spotted salamanders are fossorial, meaning they spend most of their time underground. Holbein watercolors in a 5″ x 9″ Moleskine Watercolor Sketchbook. 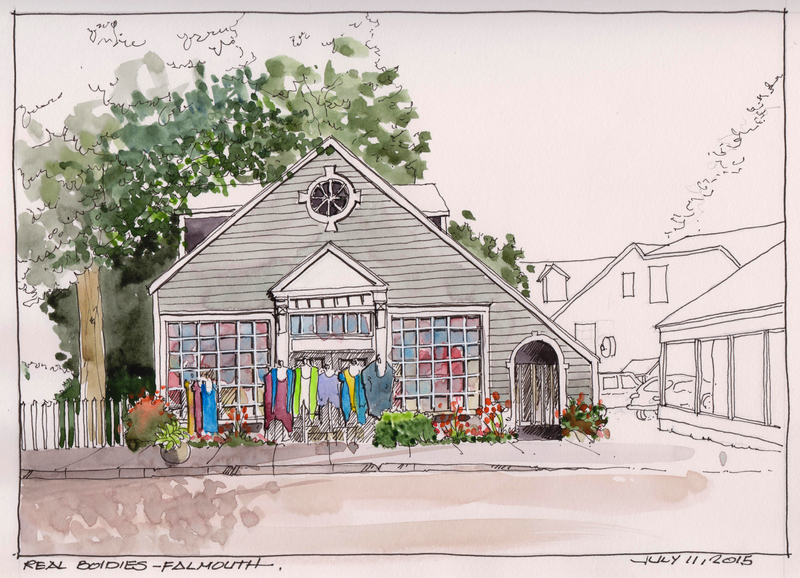 Real Bodies store in Falmouth, Massachusetts specializes in women’s clothing and accessories in beautiful Batik fabrics from Bali. This was sketched on location with watercolor added later in the studio/ Faber-Castell Pitt Art pens with watercolors and accents with a white gel pen in a Stillman and Birn 9 x 12 Alpha Sketchbook.